Pestilent wrote: That worked perfectly. YAY! it must of been something to do with the server setup, i've seen it once before and it turned out that the server (shared host) had some funny caching setup. upload extensions get past it by doing everything it needs to do before allowing extension to be enabled unlike the default one in phpbb. I need your module discord. Can you say me who i can use your discord module for my forum. * sorry for my english, i'm french, and its diffcult for me to write english. it works on phpbb 3.2, its running here without issue. But i try to install and it make error in my sqldata. so i reinstall it and i return to you if i have error. but i use a extension installtor and now its good. the filed for hidden by channel name is limited with number of characters. Could you increase this? Moreover, how to list more one channel in this field? I don’t understand the correct characters to enter between two channels. try the above file to fix the maxlenght. this is how you can add channels to the ignore list. This is the FRENCH translation for the Board3 Portal extension block Discord. First of all, thank you for your wonderful job as it is really useful and I appreciate it a lot! I can't find anywhere in the ACP a way to specify my Discord invitation, therefore the button points to https://www.irp-smart-rx.com/transfert/app.php/null. I also checked in the code, but I saw nowhere to put the https://discord.gg/blablabla in it. I have a guess it is in the bp3discord.js, line 203, but it doesn't seem to work. Can you help me on this, please? It's by the way my most important problem. 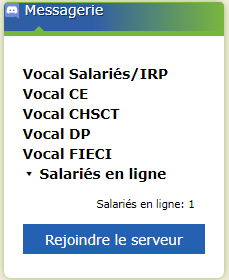 If an user is in a masked vocal channel, the widget on my forum's portal says there is one user online, but doesn't give his name. Is there a way to fix it? In this example, I masked "FIECI2", logged into this channel and tadaaa... I'm here but not visible at all. When you clic to collapse "Online users" in french, it says "Online users" in english rather than in french. I manually changed it in the code to show "Utilisateurs en ligne" in french, as the code uses text rather than variables here! Therefore, I managed to order them the way I want cheating with the space bar, but it's unelegant! Sorry for disturbing you with these bad news. By the way, I really love your extension and as I said it is really useful to me and my colleages.